Tarr's latest fantasy (King and Goddess, 1996, etc.) 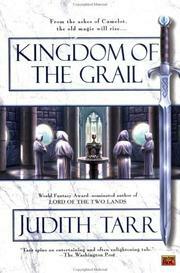 combines medieval French romances and the historical Charlemagne in a post-Arthurian yarn. Merlin, still unable to escape the magical trap prepared by his perfidious lover, Nimue, is visited by his descendant, Roland. With his powerful magic, Roland vows one day to free Merlin. Outside Merlin's enclave, Roland serves Charlemagne, King of the Franks, who's being offered a deal by a Moorish faction to invade and occupy part of Spain; in exchange, Charles must agree to treat his Muslim subjects fairly. With the Moorish delegation is Sarissa, beautiful healer and powerful magician. She creates a dazzling magic sword and arranges a competition among the Franks, the winner to take the sword. Sarissa hopes Charles will win and become their champion. Instead, Roland wins the sword, but Charles agrees to the deal anyway. Roland's true foe is the devil incarnate, whose human guise is Ganelou the monk. A favorite of Charles, who refuses to dismiss him, Ganelou beguiles and corrupts Charles's deformed young son, Pepin. Ultimately, the fate of the world hinges on the outcome of a battle between the forces of darkness, led by Pepin and Ganelou, and the forces of light, championed by Roland and his Grail mages. Solid, more than a tad stolid: Tarr's historical expertise puts flesh on some rather ordinary fantasy bones.